Logo and insignia designs of European violent left-wing groups of the mid- to late-20th century. Five-pointed stars seem to have been mandatory. Rote Armee Fraktion (aka the Baader-Meinhoff Gruppe, Germany, 1970-1998). Features a stylised Heckler & Koch MP5 machine gun. Revolutionäre Zellen (Germany, 1973-1993). Curious typography. Partido Revolucionário do Proletariado -Brigadas Revolucionárias (PRP-BR, Revolutionary Party of the Proletariat – Revolutionary Brigades, Portugal, 1970-2002). The only ones without a five-pointed star. Grupos de Resistencia Antifascista Primero de Octubre (GRAPO, First of October Anti-Fascist Resistance Groups, Spain, 1975-2007). Nice colour scheme. Forças Populares 25 de Abril (FP-25, Popular Forces 25 April, Portugal, 1980-1987). Diagonal design similar to the flags of Tanzania and Namibia. Devrimci Halk Kurtuluş Partisi-Cephesi (DHKP/C, Revolutionary People’s Liberation Party-Front, Turkey, 1978-present). Cellules Communistes Combattantes (CCC, Communist Combatant Cells, Belgium, 1984-1986). Brigate Rosse (Red Brigades, Italy, 1967-1988). This insignia appears to be a digitised version of the banner that was shown in the famous photograph of Aldo Moro taken during his kidnapping and murder in 1978. Action directe (Direct Action, France, 1979-1987). Epanastatiki Organosi dekaefta Noemvri (17 N, Revolutionary Organization 17 November, Greece, 1975-2002). Similar to the flag of Vietnam. I like the Forças Populares 25 de Abril insignia. It immediately made me think of African flags and, in particular, the Mozambiquan flag. 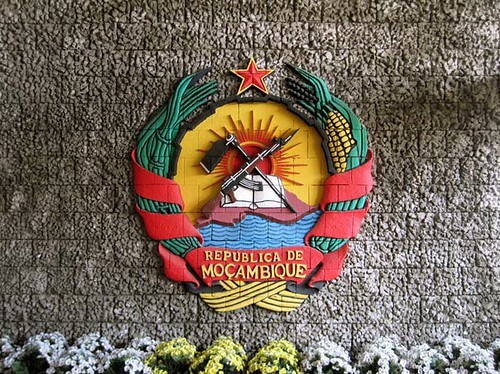 It bears the, most likely FRELIMO-inspired, national communist insignia: a book, a hoe and Kalashnikov rifle superimposed on a yellow star. On arrival at Maputo International Airport last year, I was greeted by this very colourful national insigna, right inside the arrivals hall. It seems to be made from carved or moulded concrete blocks. 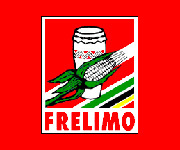 FRELIMO, the ex-Marxist ruling party (having defeated RENAMO, the South African-supported puppet paramilitary in the civil war), have replaced their “hoe and sickle” logo with something altogether more ideologically acceptable. Historical progress towards freedom and development has, I guess, been replaced by food and dancing.